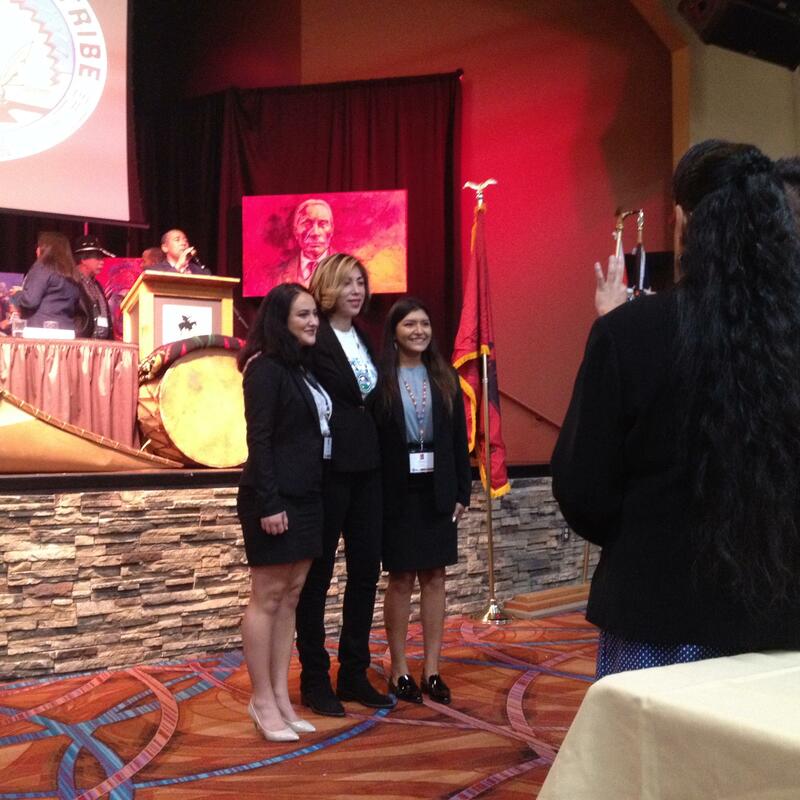 Idaho gubernatorial candidate Paulette Jordan poses for pictures after she gave a talk at this week's Affiliated Tribes of Northwest Indians conference in Worley, Idaho. This week, leaders of the Affiliated Tribes of Northwest Indians are holding their annual fall meeting at the Coeur d’Alene Casino and Hotel in Worley, Idaho. What’s different this year is that one of their own is fully immersed in a high-profile campaign for Idaho governor. Members of a national candidate recruiting organization are touting her campaign as one of the success stories in a big year for women running for office. Coeur d’Alene tribal member — and Democratic candidate for governor — Paulette Jordan has been away from home a lot lately. She returned on Monday to greet friends and relatives who had come to Worley for a conference. Jordan gives a brief greeting in Salish and English. “Hello my good relatives. Good morning." “My staff and I, we very much want to be the best hosts and representatives as possible, but we’re in the broad midst of our campaign and it’s been incredible. So I’m really proud to share this experience with all of you," she said. Jordan says she had just flown in from California. Since she won the Democratic party’s nomination in May, she’s been very much in demand as one of the symbols of the growing number of women running for office, especially in the Democratic party. “Her visibility running for office like governor has reached not just a national audience, but an international audience," said Muthoni Wambu Kraal, the vice president of national outreach and training at Emily’s List. It’s an organization that recruits women who are Democrats and pro-choice to run for office. She was in Worley to test the organization’s first training program for indigenous women interested in running for office. Her colleague at Emily’s List is Vanessa Cardenas. “Since the 2016 election, more than 40,000 women have reached out to us saying they want to run for office. Now, if you compare that to the entire 2016 cycle, we had a total of 920, so the volume is huge. The reason why we developed this training is to give women some basic tools that they need so they can run for office,” Cardenas said. Cardenas advises prospective candidates to do their research, about themselves and the offices they seek. Then she and her colleagues teach them about fundraising and how to tell their personal stories. Wambu Kraal says it helps when women can see that other female candidates are successful. “If you can’t see it, how do you know to be it? We’re hearing that over and over and over again in rooms. Candidacies like Paulette’s are absolutely essential. There are women who are showing up, absolutely inspired by the fact that she is running,” she said. Jordan’s odds of winning in a deep red state like Idaho are long, though a recent poll showed her within single digits of the Republican candidate, Lieutenant Governor Brad Little. So she still has work to do before she can become the Gem State’s first female governor. But Paulette Jordan believes the big picture trend for female and Native American candidates is a positive one. “People are supporting us, seeing that there’s a powerful indigenous voice that needs to be represented, not only at the state level, but also at the federal level and, of course, at the local city council seats, mayors. We have people who are running for county commissioners. So we have to be proud of that because our folks have come a long ways,” she said. Ultimately, Vanessa Cardenas from Emily’s List hopes the percentage of women in public office, in general, matches the percentage of women in the population. We have a long way to go, she says.